If you want better conditions in Scotland for cyclists you’re eventually going to have to get to grips with the Cycling Action Plan for Scotland (Caps). It’s an annually updated summary of the (Scottish) Government’s aims for cycling, including how they’re measuring their progress towards success. It’s also a fantastic collection of weasel-words, carefully spun statements, and dodgy data. To help you get a firm hold, here’s another enthralling delve into tedium. I’ll quote the important bits, but if you want to read along you can get the latest 2013 copy here (there’s also the 2012 progress report, and the first edition from 2010). At its full length this post was making my brain dribble out of my ears with boredom, so I’m breaking it up into three sections. First there’s the post you’re reading now, talking about The Shared Vision and the actions to make that vision come about—taking most of it at face value. Next, I’ll examine how the Government intends to measure its progress against the vision and those actions. The final instalment will attempt some light analysis into Caps, trying to cut through hairy shell of political arm-waving to expose the tasty milk of truth. That was a coconut analogy, in case you were confused. Given that the rest of Caps is all about pulling together to achieve the Shared Vision, it’s a little alarming that nobody seems clear on what it is. We’re definitely talking about 2020, and it’s (hopefully) safe to assume by bike means cycling. The rest of it is spin-tastic. For example, in 2010 it was 10% of all journeys. By 2013, that had morphed into 10% of everyday journeys, with no clarification on what the difference is. It was definitely a deliberate move as the change ripples through the entire document, so I imagine it’s a stepping stone towards a future change to something like 10% of journeys under five miles or 10% of commuters. No-one is quite clear what a vision is, either. In November 2012 Nicola Sturgeon talked about the Government having commitment and determination to achieve the [10%] target whilst giving evidence to the Infrastructure and Capital Investment Committee in her role as deputy first minister and cabinet secretary for infrastructure, capital investment and cities (page 15 of this record). All the Caps (Capses? ), however, are all very careful to refer to a vision, not a target, and SPT took pains to emphasise the same when I emailed them about their poor response to Glasgow’s City Centre Strategy. Most recently transport minister Keith Brown clarified that we all need to be committed and determined to aspire to the 10% vision. This was said whilst explaining his disappointment at the drop in cycling levels from 1.3% in 2011 to 1.2% in 2012. In summary: it’s a vision not a target as it requires more than just the effort of the government to achieve. I’m intrigued how our leaders believe that birth weight of babies is something solely under their control. Presumably some kind of in utero forced-feeding programme is on the cards. As Spokes wrote in 2013, the sole reason the Government doesn’t want 10% to be a target is because they don’t intend to meet it, and keeping it as a vision means they can’t then be accused of failure. 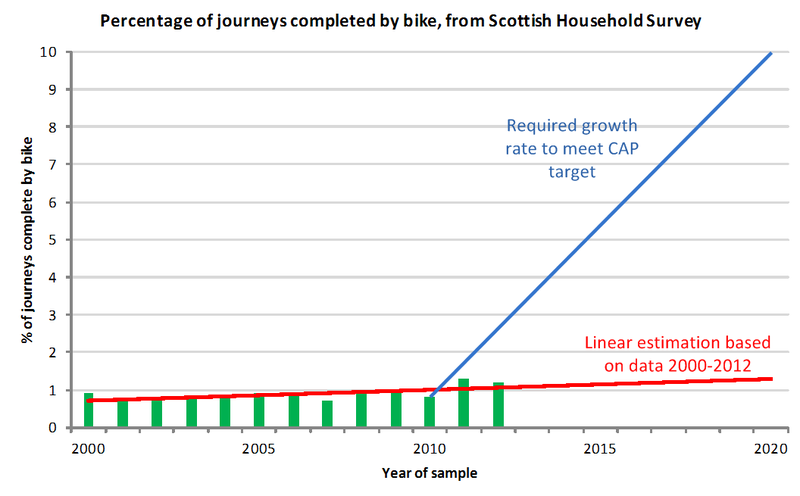 Low Carbon Scotland has a milestone of at least 10% of all journeys made by bicycle (page 29, §2.6), as part of the tracking measures to meet the Climate Change (Scotland) Act. Preventing Overweight [sic] and Obesity in Scotland includes [the CAP] proposes that by 2020 10% of all journeys are made by bicycle (§6.12, last line on page 20). As members of the public, we can also help hold our public bodies to account. Call it a target. Or the 10% target. Or the 10% by 2020 target. As well as the snappy (headline-friendly) alliteration, we’ll force our lethargic politicians to either accept our new definition or to start every conversation on the defensive. Just before we get back to the rest of Caps, clearly there’s no way for anyone to actually count every single journey made in Scotland to see if we’re meeting the target. Instead, progress is measured using data from the Scottish Household Survey (a sample of about 20,000 homes); specifically the percentage of adults citing the bicycle as their primary mode of transport. Transport modes generally classified as active transport are in green (I refuse to include taxis in that). I’ve labelled it, but the big jump in pedestrians from 2006 to 2007 was caused by a change in the survey method rather than anything more promising. Click for a bigger version. 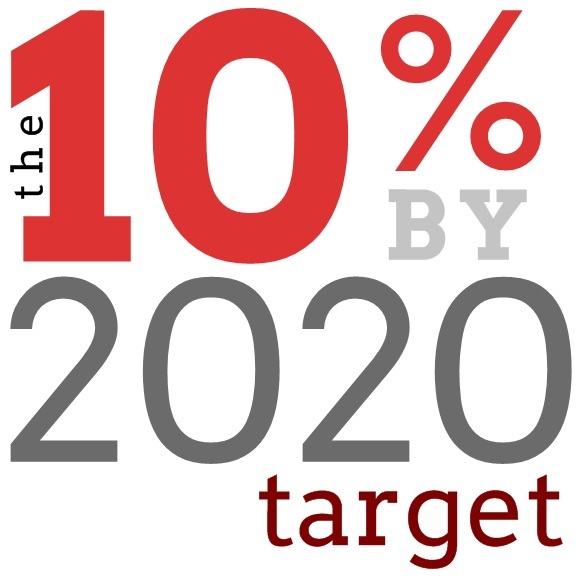 Caps has assessed that these 19 actions describe how we can work in partnership to achieve [the 10% by 2020 target]. These were updated in 2013, and are divided into sections that I’ve mirrored below. I’ve had to paraphrase the lot, or we’d be here for hours. As a quick overview, there are three actions that come under leadership (ie ‘stuff that the Government should probably do’), only two actions about cycle routes and infrastructure, a grand eight actions about behaviour and promotion, and no actions whatsoever under the resourcing and money section. Make of that what you will. Start an Annual National Cycling Summit to lead delivery and gauge progress. Each area to develop a strategic approach to support cycling, including mapping required infrastructure improvements. The section starts off with a long defence about why the 10% vision is not a target, and why most of the responsibility for the implementation of Caps should rest with local authorities and not the Government. We’ve talked about that already. The Climate Change Scotland Act gets a mention, along with Smarter Choices, Smarter Places. Apparently Glasgow received £2.5m of cycling funding to improve matters prior to the Commonwealth Games, so it’ll be fun to chase down what that actually went on. Regional Transport Partnerships (like our own dear subway company SPT) have a clear strategic role to play in supporting delivery of the Caps through their Regional Transport Strategies. We also have a National Cycling Interest Group to coordinate a variety of national agencies, charities and third sector groups. Locally, increased participation in active travel needs concerted action across the delivery landscape, ideally based on the lessons learnt through Smarter Choices, Smarter Places. Those lessons distil down to getting lots of different, small groups to run projects which are closely coordinated by a central strategy group. Also a special mention for the use of local cycle fora, which is as tedious a piece of Dog Latin as “the agenda for this meeting are”. 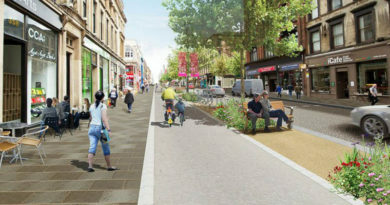 Develop and maintain high quality, local, cycling infrastructure that links communities, particularly in urban areas. Keep supporting the National Cycle Network (NCN) to connect rural communities and provide long-distance routes. Improve integration of cycling with public transport. Assess whether the Stirling Cycle Hub can be rolled out to other railway stations. Promote 20mph schemes in all residential areas. Deliver a ‘Mutual Respect’ campaign for all road users. We open with a section on Developing the Cycling Network; we need to ensure that: appropriate infrastructure is developed; is maintained to a high standard; and that the roads are as safe as they can be for cyclists. Caps2010 and the Road Safety Framework 2009 should drive this. There’s a sense that the idea is to let every local authority sort out their urban hubs, and then connect everything up using the Trunk Road Cycling Initiative, which confusingly is about supporting the provision of safe cycling routes away from the trunk network, across the country (my bold). Confusingly, we’re then told that all new trunk road schemes should make special consideration for cyclists. The end goal is that all trunk road improvements consider provision for cycling and walking where no suitable parallel links exist on quieter roads, although note the use of consider rather than actually do something about it. The Road Safety Framework to 2020 is mentioned along with a variety of mutual respect campaigns. 20mph zones also get a paragraph, with Transport Scotland intending to streamline the approval process for these. There’s a section on why we’re not getting strict liability (that misses the point completely), but I’ve talked about that elsewhere. Summarising; the available data does not supply robust evidence of a direct causal link between strict liability legislation to levels of cycling and KSIs, which is rather like saying there is no evidence that knife crime laws affect the number of bacon rolls consumed by MSPs. Of course there’s no robust link—you’re measuring the wrong thing. Anyway. Cycling By Design is there, but then the rest of the section waffles on without really saying anything. Expand Bikeability cycle training in schools. Design some adult cycle training resources. Help community-led cycling initiatives, including dispensing cash via the Cycle Friendly Communities Fund. 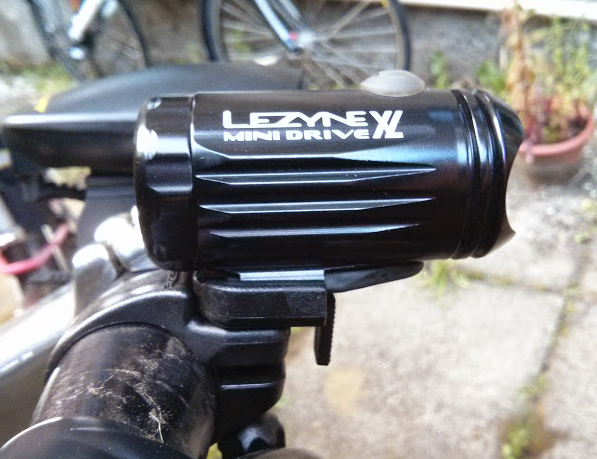 Support projects which encourage primary-school children to continue cycling at secondary schools. Generally promote cycling to young people. Help more people access bikes (particularly in deprived areas), including bike libraries for schools. Develop follow-up work from the Smarter Choices, Smarter Places evaluation report. Trying to encourage people to change their travel behaviour and become more active is a major task. Especially when you don’t want to spend any money, eh? There’s nothing to this section that isn’t summarised by the actions. No actions at all. None. This is the worst section in the document for spinning words around without saying anything meaningful. It’s dire, with phrases like complex in the context of consideration of the preventative spend agenda; delivery trajectory; and endeavour at new levels of intensity and in a steadily evolving delivery landscape. It’s clear that the attempt is to justify why the Government doesn’t want to commit significant amounts of money, for example; [because this is all so new] the overall resourcing needed will become clearer over time as experience grows and new approaches develop. The obvious counter is we’re four years in to a ten year program, so surely we must have a slight idea on what we need to spend? Given the lack of actions and how little I actually trust what’s being said, I’m not going to bother with the rest of this section beyond a single useful sentence: with regard to Rail, enhancing the travel experience [through investment in stations and rolling stock] is proven to be a driver in modal shift. Why the authors refuse to accept that similar investment would result in similar gains in active transport is a mystery. Report annually on an appropriate suite of national cycling participation indicators. Develop local monitoring to ensure a coordinated approach to cycle data collection. Last section, but as I’ll be doing a separate article on the monitoring of Caps we can fly through it. We need a robust monitoring framework to track progress with delivery. There’s an agreed set of indicators. 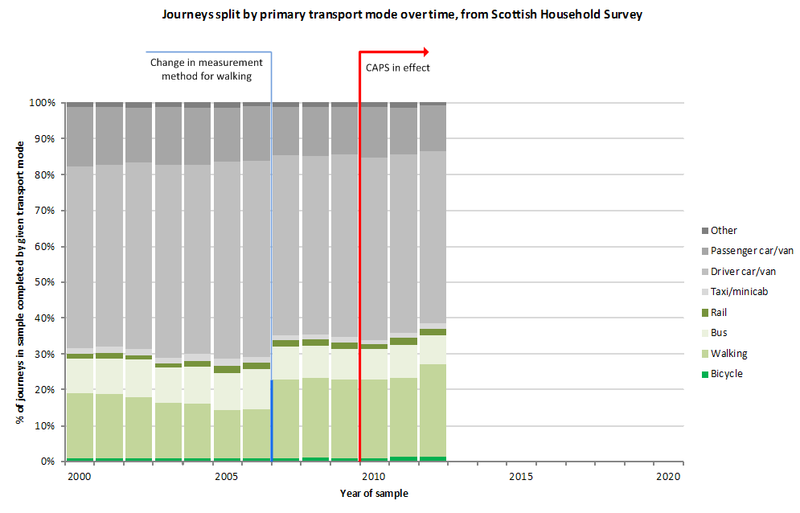 Data about cycling is (at best) patchy, so many metrics come from the Scottish Household Survey. The Hands Up Scotland Survey in schools is also included, along with the expected road safety data sets. Physical data is available on the length of cycle routes in local areas, although from experience most local authorities are willing to count pretty much anything as a cycle route (including high-speed bus lanes, if you’re in Glasgow), so treat that with a grain of salt. The various oversight groups (National Cycling Interest Group, Scottish Transport Appraisal Guidance, Cycle Tourism Forum, Caps Delivery Forum, etc) all have somewhat vague roles to place in monitoring, with the vagueness really stemming from a lack of ownership of the entire Caps project. Although the action is to report annually, the next Cycling Scotland progress report after 2013’s isn’t due until 2016. The gap seems to be covered by the new annual cycling summit although, again, it’s not clear who’s responsible for what. Well done, we got through it together. That was Caps taken almost entirely at face value (although I failed in the resourcing section—even I won’t parrot that nonsense). Next we’ll look at the metrics for measuring the Caps progress, and finally I’ll compare what Caps says with what’s actually happening out there in the streets. If you just can’t wait until then, let me point you towards some other people. Pedal on Parliament wrote about Caps—A Failure of Leadership. SRD assessed it here. CTC have a slightly more favourable assessment here, whilst still attacking the Government’s refusal to seriously invest in their targets. SUSTRANS are thoroughly alongside Caps, but given 45% of their funding is from the Government their objectivity is somewhat questionable. The 2013 progress report from Scottish Committee on Climate Change is sceptical this [10%] target will be achieved, but endorses the current support for cycling infrastructure. Let me know who I’ve missed off in the comments and I’ll add links in.